Jay Combi P Soft Cushion With Deeper Leg Troughs. The Jay Soft Combi P is a wheelchair cushion that has been designed for users looking for comfort and basic positioning. Included in its many features, is an incontinence resistant coated foam base - that has been premoulded to ensure maximum comfort. With its black sealed, easy-clean foam cover, the Jay Soft Combi P is also suitable for those with symmetrical posture. And if skin damage is an issue for you, you can rest assured that the Combi P has been designed to reduce chance of skin breakdown. Specifically built to address posture, skin and comfort needs - the Combi P.
The Soft Combi P's soft foam base is contoured to encourage proper positioning of the pelvis and thighs. The blue coating protects the foam from moisture build-up and is easy to wipe off and clean. 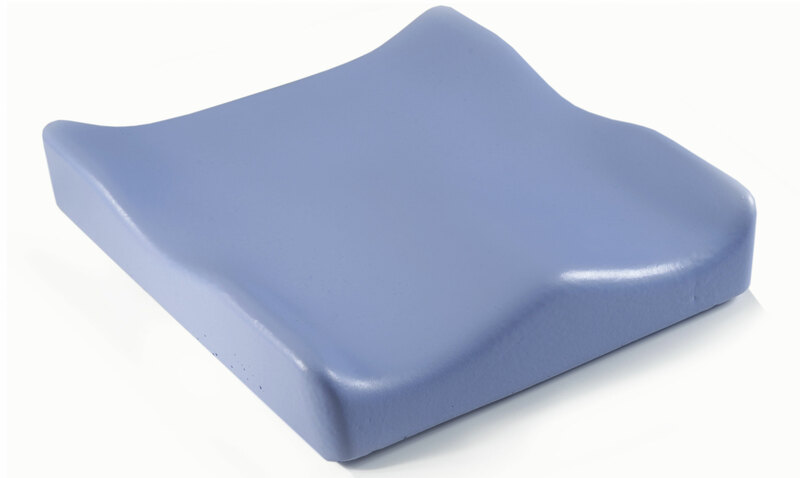 A moisture-resistant cover further assists with incontinence management by protecting the Soft Combi P's foam base from moisture build-up. Its no-slip surface keeps the cushion in place during use and transfers.